Ronson Queen Anne was a very popular wick lighter, especially in the United States in the 40's and 50's. It was named after Queen Anne of Great Britain, who reigned from 1702 to 1714. This model was first manufactured in 1936 in Newark, New Jersey, USA, than also in the United Kingdom. The production ceased in 1961 when the new Queen Anne with the Varaflame insert was introduced into the world market. The lighter has a very robust construction which made it very durable and widespread. It is silver-plated and the base is padded with green felt. The lighter has three different patterns: a tulip scroll around the top, pearl like bead around the middle and fan like pattern going down the edge. Good work of craftsmanship - a not expansive must have for your collection. There are two different versions of this wick lighter. First produced between 1936 and 1949 (USA, Canada, England) had a radius on the top of the snuffer cap next to the flint wheel. The second one had a flat top snuffer cap and was produced from 1950 till 1961 (Canada, England, USA). The Queen Anne was advertised as: "A gift that will last a lifetime". The newer Queen Anne was also available in rhodium plate finish which is uncommon. Many rip-offs were produced in the 1950s, mainly in Japan like the Kensington Omsco Lite. It uses lighter fluid as it is a wick lighter. how do you put the flint in? Got one from my girlfriend for my birthday... I love it! It will go well in my collection. i saw this lighter in a charity shop today,it only cost about 50p.it,s the made in england one.some of the silver plate has worn off in places& the flame part of the lighter doesn,t open,but,i don,t mind,i don,t smoke,i bought it because i liked it. Well done! It is a lovely lighter indeed! Very decorative! Just bought one at an auction for $3.00 CDN & I love it. hola acabo de encontrarme este modelo de encendedor precioso esta algo desgastado por el tiempo pero pienso regresarle su belleza restaurandolo .. solo que no entiendo ciertas cosas... a kein le podria enviar este encendedor existe algun profesional en esto ... como se les llama?? I've got one of these. The puzzling thing about the information provided is that the one I have was made by MTC in Japan. I thought that was interesting because there's no mention of them being made in Japan. Jesse, you do not need to be puzzled. You just have an imitation of the Ronson Queen Anne. Your lighter might be very similar though I assume it is chrome-plated and made in the early 1950s. I bought a Rhodium plated Queen Anne that has "MADE IN FRANCE" on the bottom from a flea market on the cheap. Is it a knock-off also? It doesn't appear to be a wick lighter, but it does have a flint receptacle. How do I get it to work? Does it take compressed or liquid butane? 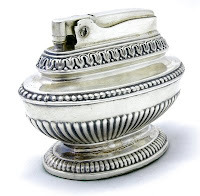 What is the procedure to refill a Ronson Queen Anne table lighter? You should check this link: http://table-lighters.blogspot.com/2009/07/how-to-maintain-table-wick-lighters.html Hope it helps! I have one of these originally purchased by my grandfather. Unfortunately, the fill cap is frozen and cannot be turned. Does anyone have any ideas? where can i buy a wick for this type of lighter? Does anyone know how much these were sold for when they were first released? Yes, the Queen Anne was sold for $6,50 till 1940. I have a Ronson lighter which in the bottom says British Empire Made In Hong Kong US patent 2.481.195. Is this worth anything? I have found this lighter, well 2 really one is a Queen Anne for sure, but th other on doesnt have any name on the lighter just the Ronson name Newark NJ USA and the Us Pat. number 19023 aand Ronson Art Metal Works Inc. I have a lighter that looks exactly like a Queen Anna, but there is no markings. Is it a knockoff? I just picked up a pair of Queen Anne lighters at an auction. Both have all of the standard Ronson verbiage in the proper sequence on the bottom. However, one of them has a Roman numeral 4 (IV) stamped on the bottom edge and the other doesn't. The stamping looks to have been done with a pre-made metal stamp rather than by hand-engraving, etc. Any ideas on why the difference, or the significance of the stamp? i have the newark model.it came with a matching ronson made ashtray(it looks like a vase) and is a 1/4" taller than the lighter and 2" across the opening,how much value does this add? Performing surgery right now on a Queen Anne. Taking out an old flint that is deteriorated, taking a long time, using tweezers. Looking forward to firing this thing off. Marked "made in Japan" on the bottom. Knockoff? Would this be one of the earlier lighters ? I recently found a Ronson varaflame Queen Anne table lighter in my grandfather's things after he passed. The lighter is in fantastic shape and the box as well as instructions and Ronson tag are included. My question is this how much do these packing materials increase the value? I cant send pictures if necessary. Is it better to polish this lighter or leave the tarnish? I done want to ruin it but I want to restore it and may need to polish to clean up a few areas.